Gum disease, or periodontal disease, ranks as one of the biggest threats to enjoying a lifetime of healthy teeth and gums. During the early stages of the disease, commonly known as gingivitis, bacteria found in plaque irritate our gums, which may cause the tissue to become red, swollen, and to bleed easily, especially after brushing and flossing. Prolonged irritation causes the gums to separate from the teeth, leading to the formation of pockets (also known as “spaces”). When left untreated, gingivitis can progress into the far more serious periodontitis, an advanced form of the gum disease that is the leading cause of permanent tooth loss in adults. Periodontitis progressively destroys the soft tissue and underlying bone structure that holds our teeth into place. Periodontal disease and decay are both caused by bacterial plaque, the yellowish film that sticks to your teeth along your gum line. Plaque hardens into a rough, porous substance known as calculus (or tartar) if not consistently removed each day by brushing and flossing. Preventing gum disease requires practicing quality oral hygiene at home, along with regularly scheduled cleanings and exams with our staff at Feldmanis Family Dentistry. In cases where gum disease threatens the long-term health of a patient’s teeth, periodontal treatment is required to restore a patient’s gums back to health. Scaling and root planing is a common treatment for periodontal disease. This method allows Dr. Feldmanis and a registered dental hygienist to provide a deeper cleaning between the compromised teeth and gums, preventing progression of the disease. Scaling and root planing in Eugene is a periodontal treatment designed to remove tartar buildup that causes the inflammation of gum tissue. Once Dr. Feldmanis performs a complete examination of a patient’s current oral health, she may recommend the need for this type of treatment in cases where deep pockets have developed along the base of the gum line and significant tartar buildup has occurred on the roots. Scaling. Using a specialized dental instrument, Dr. Feldmanis will remove plaque and tartar buildup from the surface of the crown and supporting root structures. 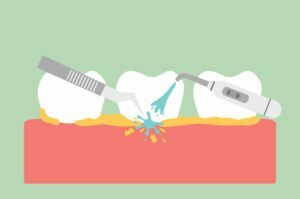 By removing bacterial buildup on the surface of the tooth roots, scaling can help to minimize further inflammation and enable the surrounding gum tissue to begin to heal. Root Planing. Once plaque and tartar have been removed Dr. Feldmanis will smooth the surface of the roots. 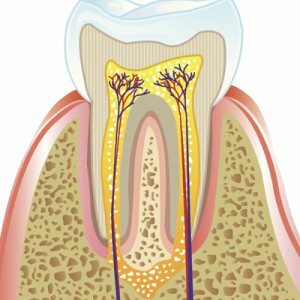 Smoothing the roots of a tooth will promote improved healing while also making it more difficult for future plaque and tartar accumulation. Following the completion of this treatment, Dr. Feldmanis may treat the pockets with antibiotics. This will help to soothe any irritation and improve the healing process. A tooth is made of pulp (also known as nerve tissue) on the inside and enamel and dentin on the outside. A root canal in Eugene is necessary when the pulp, the nerve inside the root, develops an infection. Root canal therapy usually involves one office visit for Dr. Feldmanis, a premier Eugene Oregon dentist, to complete. Afterward, it is essential that you return to have a crown or other restoration placed over the tooth to protect it. For the first few days after treatment, your tooth may feel sensitive, but any pain can be relieved with over-the-counter or prescription medications as needed.